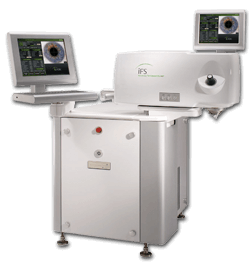 Stahl is the first private vision eye center in New York to offer patients the iFS™ Femtosecond laser system, a technological breakthrough for the IntraLase® Method of performing LASIK surgery. By eliminating the surgical blade (microkeratome) used for creating a corneal flap during conventional LASIK, Stahl is truly setting a new standard in patient safety and surgical outcomes. With the introduction of the advanced iFS laser system, Stahl set a new standard in LASIK surgery safety, precision, and control. Building upon the success the original IntraLase FS™ system, the new iFS™ technology allows Stahl surgeons to create fully customized, biomechanically engineered corneal flaps that are stronger and preserve the structural integrity of the cornea. This enables iFS LASIK eye patients to heal more rapidly, enjoy improved outcomes and reduce the risk of post-eye surgery complications. Imagine a quality of vision so crisp and clear, it’s like living in a world of Hi-Definition. A quality of vision impossible to achieve with prescription glasses or contact lenses. Vision that goes beyond 20/20. Today, Stahl goes beyond the limits of glasses or contacts with a type of eye surgery called CustomVue™ LASIK, the next generation procedure in laser vision correction. Thanks to CustomVue™ LASIK, it’s now possible for many patients to achieve a quality of vision better than 20/20. New ‘WaveScan’ technology allows our doctors to capture unique imperfections in your vision that could not be previously detected. This information provides 25-times more precision than standard measurements for glasses or contacts. Call us today at 1-888-557-4448 for your free CustomVue™ LASIK consultation and start enjoying vision like you’ve never seen. The latest technological advance in laser vision correction is “custom” LASIK surgery, which also goes by various other proprietary names, such as CustomVue™, represents the next step in improving the outcome of laser vision correction beyond the excellent results already attainable by conventional means. This is possible because every eye and its associated refractive errors are unique, much like one’s fingerprint, and recent advancements in technology now allow us not only to measure these unique refractive imperfections but also to accurately and predictably eliminate them. For the best in Long Island LASIK vision correction call us today. 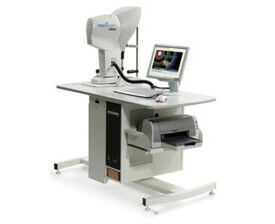 At the heart of “custom” LASIK eye surgery is the aberrometer, such as the VISX WaveScan™ wave-front measurement system. By adopting technology originally developed for high-powered telescopes, these wave-front measurement devices can identify and quantitate imperfections in the individual’s eye 25 times more precisely than the standard methods used for eyeglasses and contact lenses. This information is then digitally transferred to the excimer laser for the treatment, providing a new level of precision and accuracy. Typically, a CustomVue™ procedure takes at most a few seconds longer than a conventional procedure. 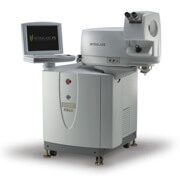 All aspects of the treatments are the same, with the main exception that the re-shaping of the cornea by the excimer laser is based on the unique wave-front information of the eye, rather than the conventional, non-customized measurements. Just like a conventional LASIK surgery, there is no pain during the procedure, and most patients notice immediate results after treatment, with continued improvement in vision over several days. Results of Clinical Study: A large clinical study, which was necessary for attaining FDA approval of this new and improved technology, highlighted the excellent results achievable with “custom” LASIK. In this particular study, one year after undergoing “custom” LASIK, 100% of the enrolled patients could pass a driving test without glasses or contact lenses. In fact, 98% of custom-treated patients could see 20/20, and a full 70% could see better than 20/20. Moreover, in this study, four times as many people were very satisfied with their night vision after “custom” LASIK as compared to their night vision before with glasses or contact lenses. Currently, “custom” LASIK is available to patients whose refractive error falls within the parameters set forth by the FDA. With additional clinical data constantly being submitted to the FDA, the eligibility for “custom” LASIK will surely be expanded. Patients interested in taking advantage of this new and exciting technology should discuss with the surgeon their candidacy for “custom” LASIK treatment. A whole new dimension in technology and safety by the leaders in laser vision correction. Star S4 ActiveTrak™ is the ONLY laser vision correction system that offers all these features and the doctors at Stahl Eyecare Experts are committed to providing the best, most accurate procedure available. The state-of-the-art laser system allows the Stahl doctors to track the movement of your eye during the procedure for more accurate results. Not to mention, the features provided by the Star S4 Active Trak laser provides a faster recovery time. ActiveTrak™ is the only system that allows the doctor to track your eye movement in all three dimensions during the treatment, for greater control. Seven variable sized beams give the doctor greater flexibility and allow for faster, smoother treatment with precise corneal shaping. Unlike other systems, with ActiveTrak™ the doctor does not have to dilate your pupils. This means an even quicker recovery time. With the IntraLase Method, tiny pulses of laser light, a quadrillionth of a second each, pass harmlessly through the outer portion of your cornea and form a uniform layer of microscopic bubbles just beneath the surface of your eye. The IntraLase flap creation process using the iFS Laser takes less than 20 seconds per eye and a total of 10 minutes for the entire LASIK eye surgery. When it’s time for your surgery to be performed, your eye care doctor easily lifts the flap to apply the treatment. The IntraLase method also delivers outstanding results and has been shown to improve outcomes for more patients. In a clinical survey of LASIK patients who had their LASIK flaps created using a blade in one eye and the IntraLase method in the other, the vision in the IntraLase-treated eye was preferred 3-to-1. We are expert Long Island LASIK vision correction eye doctors aiming for only the best LASIK results.